Last we left it, Namma had turned into a dragon and was going to destroy the planet because some younger gods annoyed her by killing her husband. 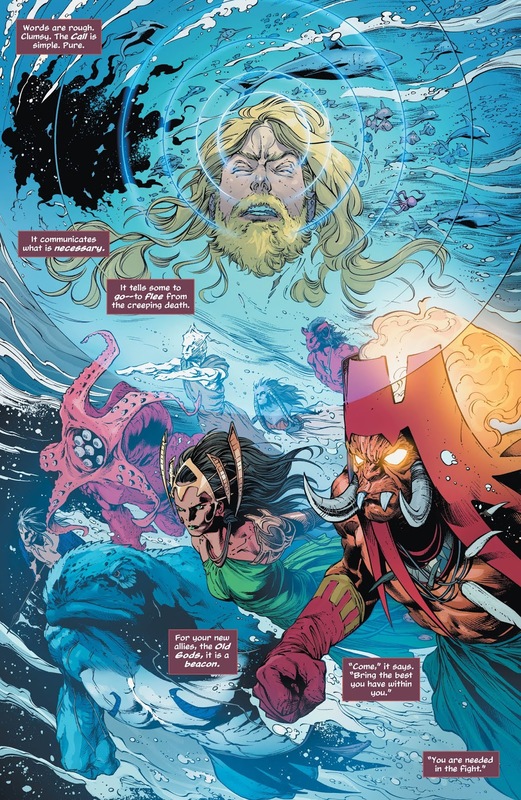 Aquaman made with the vuu vuu vuu, which called the younger gods to assist, and boy they all took on some awesome forms. 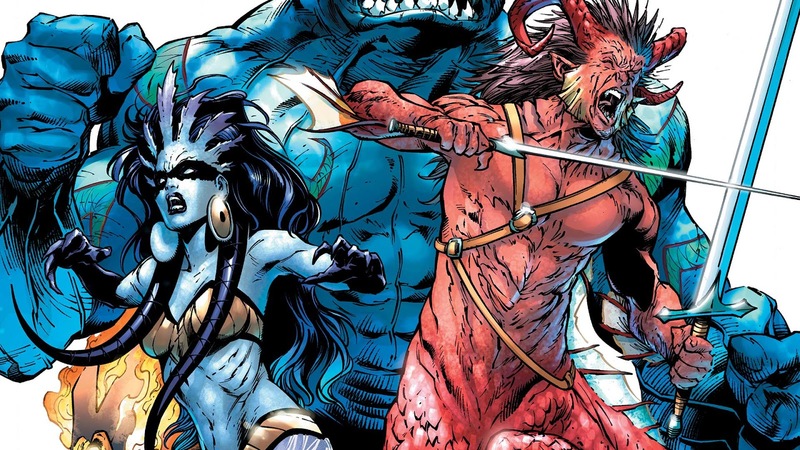 There’s one with an octopus head, one shaped like a whale, one that’s like an underwater satyr…if this is going to be Aquaman’s new posse (I thought), then this series could get awesome. 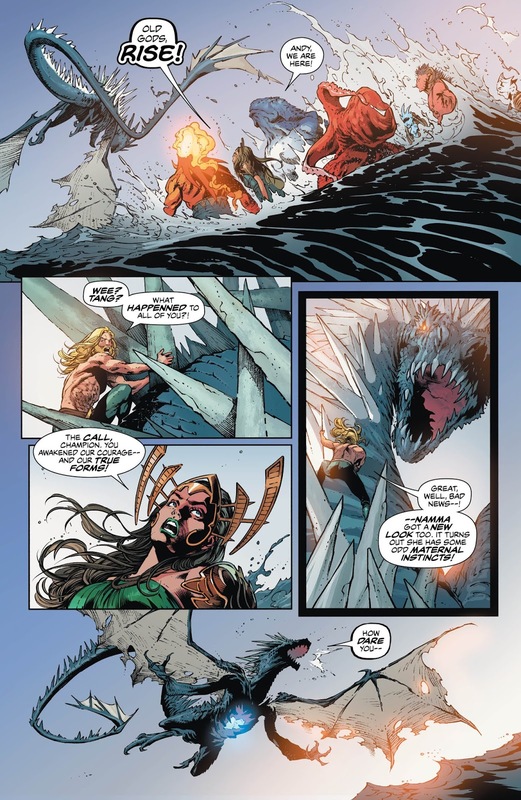 Unfortunately, the younger gods decide to sacrifice themselves to Namma in order to stave off the end of the world, against Aquaman’s protests. 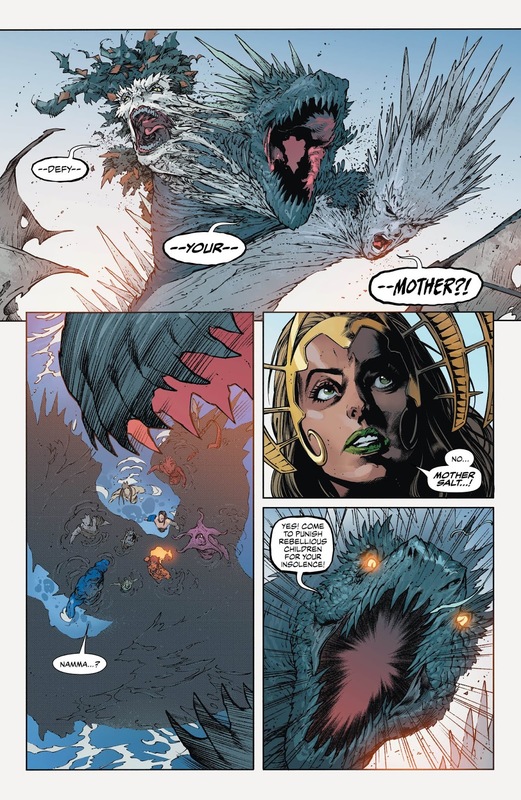 Caillie, still in her Blue Devil form on the salty shore of Namma’s island, suggests that Aquaman use his mind power again, and when he does, all of the younger gods burst forth from Namma, exploding her like a scene from Scanners. And the day is saved! The exertion messed up Aquaman, but he’s saved by Namma’s dead husband, the original god of fresh water, who must be feeling a lot better. The younger gods, back in their frail human forms, tell Aquaman that he belongs to the ocean, and to prove the point, water daddy god comes back from the sea and bestows Aquaman with a trident. And it’s a real trident, with three prongs, folks! Not one of these fakey “tridents” with five tines or whatever. Aquaman says at the end that Namma will return (which stands to reason, since her dead husband was just walking around), but for the moment, things are chill. And this was a pretty chill introductory arc for this creative team, well-plotted and paced, despite my frustration at not understanding everything in the first two or three issues. It all came together nicely, and while this issue was more a matter of story convenience than some kind of cataclysmic confrontation, it did wrap things up neatly with some great visuals and something for everyone involved to do. Nice job! 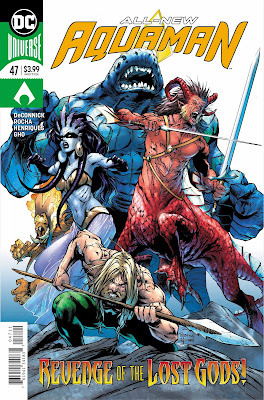 If you’ve been skipping Aquaman because the previous run dragged on forever, then you should give this story arc a look. It’s snappy and engaging, and should entertain anyone predisposed to the character. Even newcomers could be interested, so sink your money into this thing with confidence! This creative team’s opening arc ends rather neatly and abruptly, but it is still pretty satisfying for those who have been keeping up. Fans hoping for a total restoration of the character might be disappointed, but the issue ends on a familiar note that bodes good things.